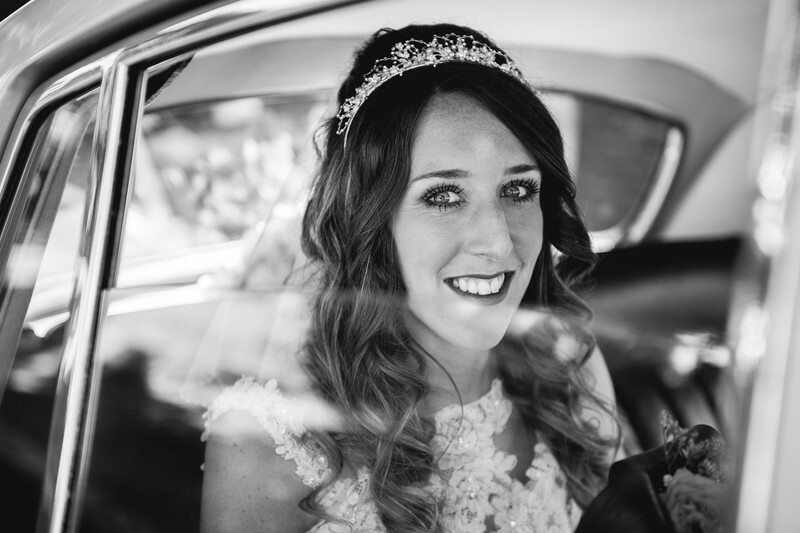 Becky and Ryan got married at Stanbrook Abbey in Worcester, but both the bride and groom had decided not to get ready at the venue - instead, Becky got ready at her parent's home in Walsall, with Ryan getting ready at the couple's house a few miles away. I had spent most of the morning with the bride and her bridesmaids, arriving quite early in the morning as the drive from the bride's parents house back to Stanbrook Abbey would take almost an hour, meaning the bride would have to be ready a lot earlier before her wedding than most brides. The bride's parent's house was massive, and gave plenty of space for the bride to get ready along with her parents and bridesmaids. The photo above was taken in the living room as the light in there was ideal. You can see the same amazing quality of light in the photo below, showing the father of the bride seeing his daughter for the first time on her wedding day in her dress. For the main image in this article, I had decided to stay longer than normal at the bride's preparation address. The wedding car that was taking Rebecca from there to Stanbrook Abbey was rather old, and wouldn't be able to get to Stanbrook Abbey before me, even if we left at the same time. This gave me a rather unique opportunity - to get photos of the bride leaving for her wedding venue, and arriving at the wedding venue! I was taking candid photos of the bride all morning, as is my style, and continued in this fashion when she got into the wedding car and was waiting to leave. As I was busy snapping away, Rebecca looked at me and gave this massive smile. I couldn't help myself and stole the photo regardless, and I'm very happy to have done - this image, as well as the two other black and white images you see in this article feature heavily in their wedding album, which I had the pleasure of hand delivering to the couple personally.